GSH Industries is a leading OEM and industrial supplier of custom made plastic extrusions, tubing, and plastic profiles in Northern Ohio. Over 60 highly experienced employees having a combined experience of 100 years in the industry. We manufacture injection moldings and more that serve a wide range of industries with innovative customized solutions. Visit our website today for more information. ICOMold has a reputation for manufacturing low-cost, high-quality custom plastic injection molding for customers around the world. We provide prototype and low-volume injection molding, export molding, and production molding with a lifetime warranty. Get a fast online quote for your next injection molding project. Our injection molded plastic parts will not disappoint! At MSI Mold, our team of dedicated staff members make it a point every time to guide our customers through every step of the process, from the design to the final product. We will help you in selecting the right material for your product so you know exactly what you are getting. Contact us and get started today! Injection molding is what we do, and we do it well. For nearly 30 years, we have continued to offer nothing but the best in injection plastic molding. We believe in offering the best to customers, including technology, equipment, service, and prices. Find out more by visiting us online or giving us a call today! We have a manufacturing history dating back to 1963 and our innovated processes have greatly improved over the years. These high performance products are long lasting and we aim to greatly improve the quality of all of our injected molded products. Our moldings are extensively tested to ensure the best products for our customers. Visit our website for more information. Founded in 1977, MN, Diversified Plastics, Inc. is a full-service plastic injection parts manufacturer. The company produces complex in-house tooling and provides precision prototype production, close-tolerance plastic injection molding, clean room assembly and value-added services. 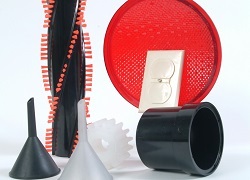 Diversified Plastics uses a wide range of injection molding plastic resins, including engineering, high-performance and commodity grade resins. If you want high quality plastic molding products, you’ve come to the right place! We are a large supplier of a variety of molded plastic parts of all sizes and types. We have the inexpensive solution to your needs that can get the job done right the first time. You will find that our attention to detail sets us apart from the competition. Give us a call or visit our website today for more info! Roughly 32% of all plastic processing applications utilize injection molding. Injection molding is the most common plastic processing method today, and enables manufacturers to fabricate plastic products in configurations that vary in complexity. Injection molding can be used to fabricate items such as automotive parts, computer parts, medical equipment, toys, tools, and office supplies. Other examples include screwdriver handles, video game cartridges, mop buckets, monitors, contact lens containers, and catheters. In almost every industrial or consumer industry, injection molded parts are used to some extent. Thermoplastics is the most common material used for the injection molding process. However, elastomers, biodegradable plastics, and thermosets can also be used. More specifically, materials that can be used for injection molding include ABS, polycarbonate, and polypropylene. Some materials, however, are more expensive than others. To keep costs low, manufacturers may find an alternative type of plastic for the fabrication process. Researching the pros and cons of various types of plastic can keep costs at a minimum. For example, not all plastics can be recycled, but materials such as polystyrene, polyethylene, and nylon can. One of the best ways to save money during the production process is recycling and reusing plastics. Many manufacturing companies have representatives that will help customers in choosing the right product the first time, which will fulfill the needs of the customer quickly and save the company money. The injection molded process itself comes with a variety of advantages. The process has a high production rate, and little to no need for further processing upon completion of the injection molded part. Despite the high tooling cost, the injection molding process has a very low production cost per part. Injection molding is the process of choice to produce highly complex items that no other process can create. Additional advantages include energy efficiency, precision in forming parts, and that it produces a small amount of waste. Hydraulic oil machines are the most common type of injection molding. These machines use hydraulic fluids to propel the mold through the machine. Toggle injection molding comes in at a close second in terms of popularity, Toggle injection molding machines move the mold through the machine using mechanical links. In recent years, hybrid hydraulic and toggle machines have emerged into the injection molding industry and are increasing in popularity, due to their ability to eliminate the problems that the other machines may have, such as rapid wear and tear of the equipment, and slow processing rates for parts. The injection molding process remains the same regardless of which machine is ultimately used. In the first step, the barrel section of the machine is heated. The next step involves placing the pellets, or granules, into a hopper. Inside the hopper, a screw mechanism forces the granules into the heated barrel, where the granules are melted down. The molten plastic is injected into a split die chamber mold cavity. Once the cavity is full, it is clamped shut. Additional fluids such as water circulate through the mold’s cooling system and remove the heat. The part is held in the mold under a high amount of pressure until it completely hardens. Finally, upon the solidification of the part, it is extracted from the mold. Rapid injection molding is another process that can be utilized. It is the same as normal injection molding, using the same materials and the same type of molds, but it is quicker and has a lower production cost. Because the molds go through the process at a much quicker rate, they need to be of the utmost quality. In the early stages of developing a new product, a company will need to develop a prototype before production of that item can begin. Alternatively, they may request that a product be made in a limited quantity as opposed to it being mass produced. Therefore, rapid injection molding is a recommended process for prototyping and small-scale production. Toys, gears, and enclosures are common items that undergo prototyping. 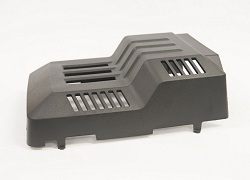 Industries that frequently utilize rapid injection molding for prototyping include appliances, aerospace, electronics, automotive, and medical. Injection molding machines are made up of a network of motors, heaters, and moving parts that require an extensive amount of energy to carry out their functions. Over the years, research has been done to make injection molding machines more energy efficient. One method that has been developed is a labeling system, which displays the rate of energy that is used by the machine. Regulated consumption of energy can help save a company money in production costs, and a labeling system is anticipated to assist in making that happen. Injection Molding – GSH Industries, Inc.